Stainless steel is both stunning in look and also practical in application when it comes to choosing a balustrading system that can last a lifetime. 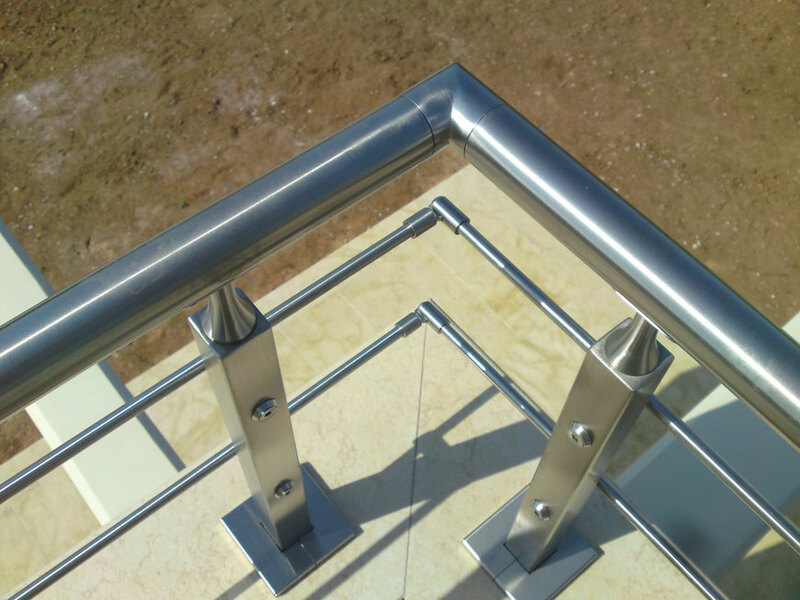 If you live in a coastal environment, all types of balustrade materials, be it stainless steel or alternative metals, will be subject to salt and wind exposure, industrial pollution and temperature fluctuation. However, if properly cared for and maintained, stainless steel will keep its ‘as new’ look for many years to come, far outperforming alternative metals. Stainless steel is a corrosion resistant alloy steel that contains 10.5% or more chromium. By varying the quantities of elements added to stainless steel, a range of stainless steel grades, each with different properties, are produced. When nickel is added to stainless steel in sufficient amounts the crystal structure changes to “austenite”. Austenitic grades are the most commonly used stainless steels accounting for more than 70% of production and are identified by their ‘300’ series designation. Grade ‘304’ (18% chromium, 8% nickel) is the most common stainless steel produced, however it is inadequate for many exterior coastal applications. Grade ‘316’ (17% chromium, 10% nickel, 2% molybdenum) offers the best corrosion resistance among standard stainless steels. It resists pitting and corrosion by most chemicals, and is particularly resistant to salt water corrosion. Upgrade the look of your home or office with custom-made stainless steel balustrades,fence gates, gatehouse gates, driveway gates, privacy screens or door handles. This is just a sample of what GOLEMAS can design & manufacture for your home or business. Whether you are looking for something modern and contemporary, or something completely out of the ordinary, our team will work closely with you to create that perfect custom piece of architectural stainless steel that will not only add value but will complement the look & style of your home or office. Stainless steel is an alloy of iron-chromium-carbon with a minimum of 10.5% chromium content by weight Chromium creates a tiny layer (10-100 nm) of chromium trioxide (Cr2O3), which protects the metal substrate from oxidation and corrosion. Besides chromium, stainless steel may contain other alloying elements such as nickel, molybdenum, manganese, etc. Stainless steel produced in electric furnaces with remelting scrap (scrap), ferroalloys (eg ferrochrome, ferronickel, etc.) and other metallic additions. They are widely used in many applications requiring corrosion resistance for economic reasons (eg chemical industry), for aesthetic reasons (eg architecture) or for health reasons (eg, cooking utensils). Compared to common steels, stainless steels, in addition to much higher corrosion resistance, and additionally exhibit a higher mechanical strength. However, it is harder than common steel and therefore more unprocessable. Stainless steels also exhibit low thermal conductivity compared to ordinary steels. Stainless steel protects itself. Reacts with atmospheric oxygen and forms a protective membrane. There is no surface coating. That appears on the surface there throughout the mass of the material. Resistant to temperature and fire. Cigarettes or the flame does not leave any mark on the surface. In the stainless steel DIN 1.4301 ambient temperature having excellent resistance to oxidation even in the presence of strong acids such as nitric acid. The material exhibits excellent resistance to alkaline solutions and to organic and inorganic salt solutions. Generally the material provides excellent resistance to oxidation in the environment and in an environment of intense salt spray (ships etc.) presents virtual oxidation spots avoided by cleaning. ΣIn the stainless steel DIN 1.4401 ambient temperature having excellent resistance to oxidation even in the presence of strong acids such as nitric acid. The material exhibits excellent resistance to alkaline solutions and to organic and inorganic salt solutions. Generally the material provides excellent resistance to oxidation in the environment and in a salt spray environment of intense (ships etc.). And all this with the unique combination of quality, beauty, and reliability, we offer our customers, for 50 years.